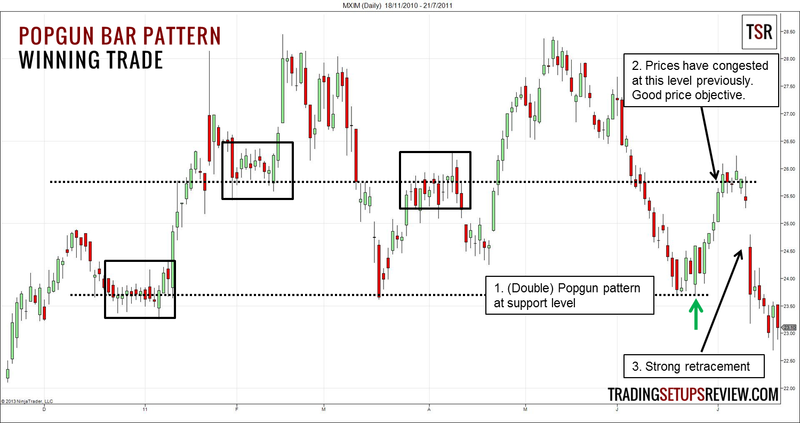 Jeffrey Kennedy from Elliot Wave International shared the Popgun bar pattern. He meant it as a way to find impulse waves for Elliot wave traders. 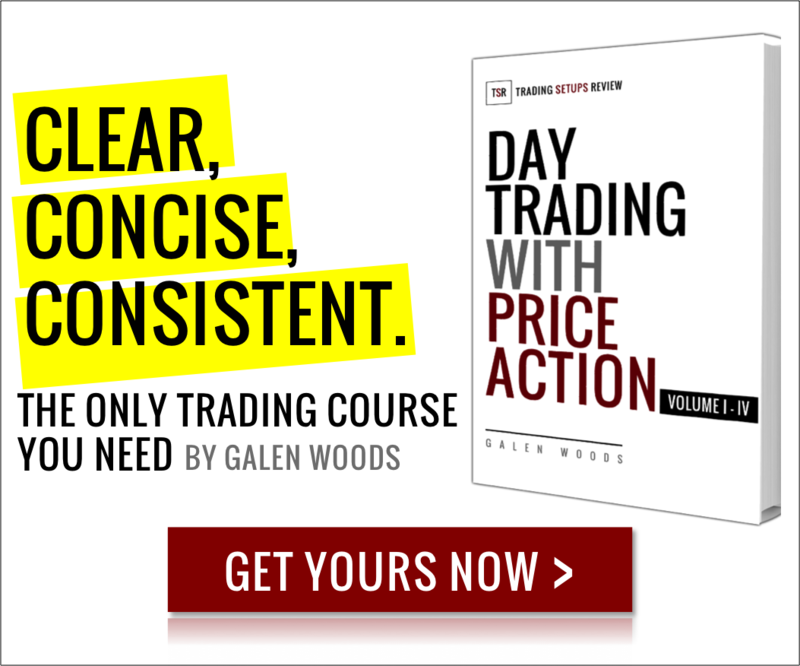 Elliot wave is a form of cycle analysis that works with wave counting. Although it is a sub-topic of technical analysis, its depth and various nuances justify Elliot wave as a discipline on its own. To trade the Popgun bar pattern, you must know what is an inside bar and an outside bar. An inside bar is one that is completely engulfed by the bar before it. It represents a contraction in range and a pause in directional trading activity. An outside bar is one that completely engulfs the bar before it. It shows strength in both directions. Depending on the context, it is a sign of strength or a precursor to erratic movements. The Popgun bar pattern consists of an inside bar followed by an outside bar. This is a daily chart of Maxim Integrated Products Inc. listed on NASDAQ. See how areas of earlier congestion acted as solid support and resistance levels. After a strong decline, a Popgun bar pattern appeared at a major support level. In fact, this is an interesting trade because we had two consecutive Popgun trading setups. 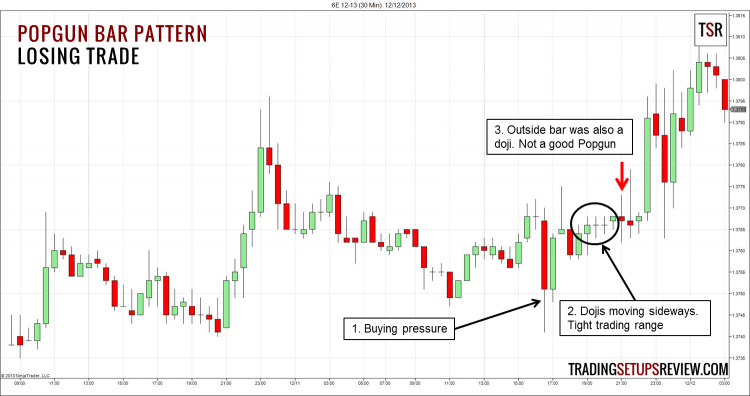 As a result, it is also an inside-outside-inside (ioi) bar pattern coined by Al Brooks in his price action trading series. The resistance area where prices have congested before was the perfect price target for this trading setup. Prices retraced quickly with a gap down after moving sideways for a few days. Although not marked in the chart, the resistance level (top dotted line) coincides with the 50% retracement of the decline from the top of the trading range. According to Jeffrey Kennedy, this pattern retraces significantly like a popgun. Hence, trailing stops are not a good idea. Taking profits off at logical price target is a better option. Let’s try to find an intraday Popgun bar pattern. This is a 30-minute chart of EUR/USD futures on CME. Despite the strong bear trend bar, the long bottom tail hinted at buying pressure. Together with the bullish inside bar that followed, we confirmed that the bear move had no follow-through. Prices started to congest and moved sideways as shown by the series of dojis. The outside bar completed the Popgun bar pattern. However, the outside bar barely managed to close below its open, and is a doji. It was not surprising that it did not do well. This pattern focuses on the change from range contraction to range expansion, and takes the change as a sign of strength. With this in mind, we should only consider Popgun bar patterns with a directional outside bar, and not a long-legged doji. Generally, outside bars are wild creatures. Price action that follows outside bars are likely erratic. Check the context for confirmation that an impulse wave is underway. When in doubt, wait for more price action to unfold. I noticed that Popgun bar patterns that do not take off immediately tend to test the low of outside bar (for long trades) before moving up. Hence, the low of the outside bar serves as a support for potential long trades. The reverse is true for short trades. Jeffrey Kennedy is an Elliot wave analyst and he shared this pattern as a way to trade impulse waves within the Elliot wave structure. To learn more about Elliot Wave, you should refer to the authoritative text, Elliott Wave Principle: Key To Market Behavior .